As Glen will discuss in his Friday post, the women in books and movies these days all seem to want to date vampires. Of course, not any vampire, but a rich vampire, and there seem to be a lot of them around. What is the secret of how those vampires got so rich? 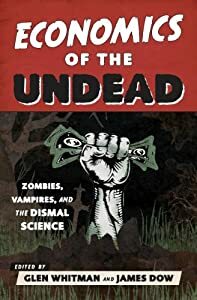 In my chapter “Investing Secrets of the Undead” I’ll show you how to turn a $1,000 investment into a lifetime of wealth that will allow you and your family to…oops, sorry, wrong audience. Actually, in the chapter I use vampires in the media to illustrate some important academic principles of financial analysis as it relates to investing. The first and obvious answer to why vampires are so rich is that vampires live (so to speak) a long time and so are in the position to take advantage of the power of compounding. Compounding does matter, but there’s more to investing than that. In the chapter, I talk about various ways in which time interacts with risk for long-term investors, such as why time diversification does not work the way many people think it does, how mean reversion potentially offers opportunities for long-term investors, and the non-financial problems that might be associated with vampires delaying their consumption until the distant future. For this post, I want to briefly discuss one particular issue: how survivorship bias can affect the use of historical data when forecasting long-term investment returns. Before I answer, let me tell you another story from a lesser-known piece of vampire fiction. Baron Federov was a minor aristocrat in the court of Alexander I of Russia in the early 1800’s. Known mostly for various bits of scandal related to the wife of a fellow noble, he lived a life of genteel poverty. However, his life radically changed one night when he was visited by Count Vardalok, who drank his blood and left him for dead. Accidentally, some of the Count’s blood dripped down the Baron’s throat, and so Federov woke that night as a vampire. Now, the Baron was a practical man and understood compound interest. Selling off what possessions he had, he invested in several promising Moscow properties and businesses, making a will that gave his assets to a “future descendant.” He faked his own death as a human and then hid away in a crypt, confidently planning to return many years hence to claim his inheritance and live the rest of his time in prosperity. In 1917 he awoke to claim his riches. Unfortunately for the Baron, this also happened to be the time of the Russian Revolution, and he awoke not to the riches that compounding promised, but instead to see all his property taken away in the communist revolution. Penniless, he wandered the streets and was staked the next night by a patrolling revolutionary guard. Okay, that isn’t a real story, but it illustrates an important point. It’s said that history is written by the winners, and that’s true for investing stories as well. Nobody is going to tell you about the money they lost playing the stock market. Because of that, you get a distorted idea about how likely it is for you to win. In the study that came up with our 7% average return, all the countries in the survey were winners. They were around in 1900 and they’re around today. If they weren’t, they couldn’t be included in the study. The name for this problem is survivorship bias and it results in return numbers that are too optimistic because poor performers (in this case, stock markets and economies that fail) are excluded. The problem of survivorship bias is well understood and adjusted for in the best stock return databases, but this is often not done with unusual or specialty asset return data. Investors beware. This entry was posted on Saturday, July 26th, 2014 at 7:56 am	and posted in Uncategorized. You can follow any responses to this entry through the RSS 2.0 feed.